Various community stakeholders and more than 200 community volunteers are working together to build a new playground for children in Prospect Park in Whitehall on Sept. 9. An old playground in the park will be replaced by a new playground with a design based on children’s drawings created at a special design event in July. 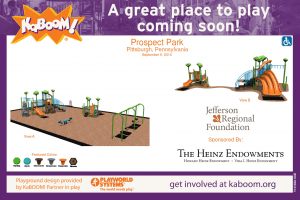 The new park will feature a variety of colorful playground equipment including climbing walls, swings and slides all in compliance with today’s playground safety standards. The park flooring will also be covered with 51,000 square feet of safety surfacing floor tiles.